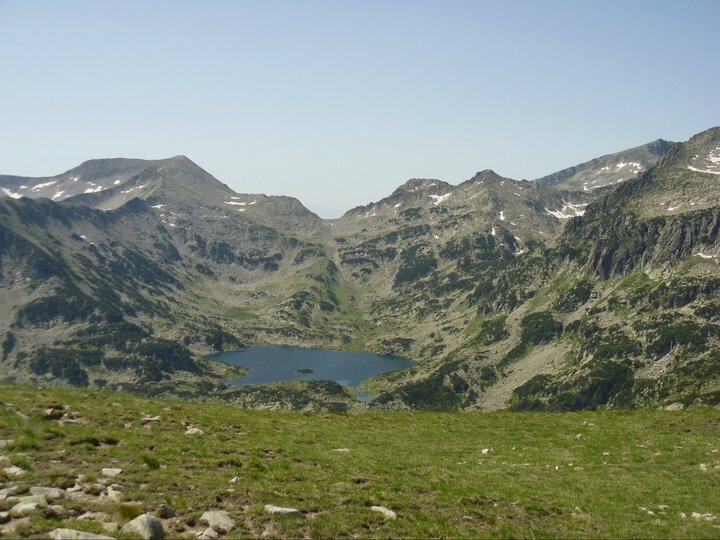 7 day guided hike in Pirin and Rhodopi Mountains in Bulgaria. The vast Rhodopi mountains are something else! Green rolling hills, endless century-old forests, crystal clear dam lakes, old remote villages long forgotten by civilization. And the good-heartedness and bright spirit of the locals which are (paradoxically) some of the poorest people in the country! Combine this with the majestic white marble ridges of the Pirins – where we climb one of the highest peaks in the country, Mt. Vihren (2914m) and some relaxing time in a hot mineral water pool – this is a trip for everyone to enjoy! DAY 1: Upon arrival at Sofia we transfer to Kozovo (2,5hrs), a tiny village in the heart of the Rhodopi Mountains. DAYS 2 and 3: Two leisure walks in the region. We will visit Red Wall nature reserve and the famous rock formations called the Wonderful / Miraculous Bridges. We will also stop by Bachkovo Monastery – one of the most renowned and beautiful in the country. In the afternoon on day 3 we transfer to Trigrad (2hrs) – another tiny village hidden deep in the mountains. DAY 4: We have a beautiful hike today climbing above the deep and narrow Trigrad Gorge, through lush green forests and idyllic peaceful meadows to the village of Yagodina and further to Yagodinska Cave. After a guided visit of the cave we have lunch and then transfer to the thermal spa resort of Ognyanovo (1hr 40 mins). Our hotel has an outdoor swimming pool with natural hot mineral water –a well deserved relaxation for your body and soul. DAY 5: Today we visit the beautiful village of Kovatchevitsa – declared an architectural reserve because of the well preserved old houses from the Revival period. In the afternoon we arrive in Bansko and will take a stroll round the old cobbled streets in the old quarters of the town. DAY 6: Welcome to Pirin National Park – included in the UNESCO World Heritage List. Today’s walk takes us round the beautiful glacial lakes of Banderishka Valley. The walk affords amazing views to the surrounding peaks – black granite on one side of the valley, and marble white on the other. Enjoy a picnic lunch by the lakes, relax your feet in the crystal clear waters, and…why not! go for a swim! Then head back to the chalet for a well deserved rest. DAY 7: After a short transfer with the minibus (30 mins) we take the chair lift to Bezbog hut and head for Mount Polejan. Numerous glacial lakes shine like sparkling gems around us on the way to one of the highest peaks in Pirin Mountains. We will enjoy a 360 panorama view from the very top, having our picnic lunch and listening to the songs of the winds coming a long way away to tell us the legends of the mountain. Before we take the lift back we’ll sit for a drink right at the shore of Bezbog lake to watch the sun go down behind the majestic peaks of Pirin.